The next Minsky conference in the Levy Institute’s international series is taking place in Athens next week, November 8-9. The central theme, as you can probably guess from the location, is the ongoing eurozone crisis. This conference is organized as part of the Levy Institute’s international research agenda and in conjunction with the Ford Foundation Project on Financial Instability, which draws on Hyman Minsky’s extensive work on the structure of financial systems to ensure stability and the role of government in achieving a growing and equitable economy. Among the key topics the conference will address are: the challenges to global growth and employment posed by the continuing eurozone debt crisis; the impact of austerity on output and employment; the ramifications of the credit crunch for economic and financial markets; the larger implications of government deficits and debt crises for US and European economic policies; and central bank independence and financial reform. Keynote speakers will include Már Gudmundsson, governor of the Central Bank of Iceland (“Iceland’s Crisis and Recovery: Are There Lessons for the Eurozone and Its Member Countries?”), Yves Mersch, member of the ECB’s Executive Board and General Council (“Intergenerational Justice in Times of Sovereign Debt Crises”), and Lord Robert Skidelsky, Emeritus Professor of Political Economy at the University of Warwick (“The Experience of Austerity: The UK”). You can find a full schedule of the speakers and panelists here (audio and select slide presentations will be uploaded during the conference). Some abstracts (pdf) for the presentations have been provided in advance. You’ve no doubt read various analyses predicting the impending collapse of the Chinese financial sector, and arguments that China cannot continue to grow at a rapid pace. While we do think that China faces some challenges, we part company with the gloom and doom crowd. What most of them do not understand is that China is a sovereign country that issues its own currency. Affordability is not an issue. China has the fiscal capacity to resolve any financial crisis, and it can “afford” to grow fast if it chooses to do so. Our paper examines the fiscal and monetary policy options available to the PRC as a sovereign currency-issuing nation operating in a dollar standard world. The paper first summarizes a number of issues facing the PRC, including the possibility of slower growth and a number of domestic imbalances. Then, it analyzes current monetary and fiscal policy formation and examines some policy recommendations that have been advanced to deal with current areas of concern. The paper outlines the sovereign currency approach and uses it to analyze those concerns. Against this background, it is recommended that the central government’s fiscal stance should be gradually relaxed so that local government and corporate budgets can be tightened. By loosening the central government’s budget but tightening local government and corporate budgets at a measured pace, the PRC can avoid depressing growth or sparking excessive inflation. Since the central government faces no financial constraints, shifting more fiscal responsibility to the center will reduce financial fragility. Larry Summers recently noted that the projected long-term budget deficit for the federal government basically disappears if we’re able to achieve annual economic growth rates that are 0.2 percentage points higher than the Congressional Budget Office assumes. The notion that eliminating the budget deficit is a valuable goal in and of itself deserves some pushback. But if you start from the premises of those who do think (or claim to think) there’s a problem with debt levels of the sort projected by the CBO, then debt hawks should be running around promoting any scheme they can think of that will boost growth. If the debt really is as big of a problem as they claim, this ought to be their first priority. And it’s a far better strategy than the current one, which seems to revolve around pushing for an increase in the eligibility ages for Social Security and Medicare. Now, it’s obviously the case that “push the US political system to pass policies that increase growth” isn’t an easy thing to accomplish, but there are a couple of reasons why this would be a better goal for (genuine) debt hawks to pursue. First, even if the FixtheDebters succeed in getting what they want, which seems to be a particular type of entitlement cut (raising the retirement age counts; reducing hospital readmissions or spending less on ineffective treatments does not), it would be a tenuous accomplishment. The CBO recently evaluated the budgetary effects of raising the Medicare eligibility age to 67 and found that it would reduce deficits by … about $2 billion per year (Aaron Carroll and Austin Frakt have more on why this actually overstates the savings). Moreover, whether the hawks intended for this to happen or not (I believe the “grand bargain” blueprint still contains some pro forma calls for short-term stimulus), their contribution to the austerity campaign that has gripped the US political system since 2010 has resulted in changes to fiscal policy that hamper the United States’ growth potential — and thereby make more difficult the job of reducing the debt as a percentage of GDP. For instance, they have lent their voices, access, and mobilization efforts to a process that has resulted in stagnating research and development spending. A new Levy Institute study shows why the deep cuts scheduled for R&D are a significant blow to the economy, and a huge wasted opportunity. Beyond the fact that spending cuts in general reduce GDP right now, well-targeted R&D investments have the potential to revitalize the US export sector. 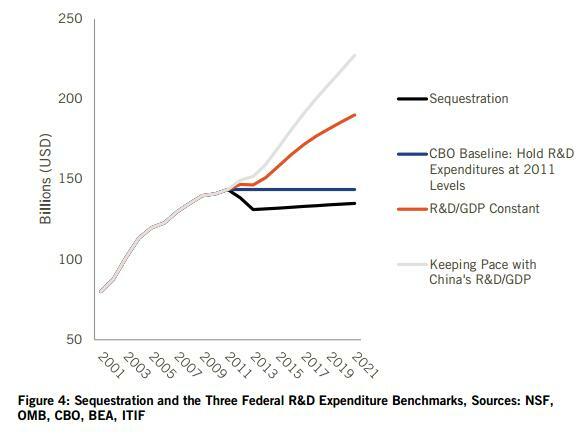 Simply halting or slowing down the R&D cuts would help; beyond this, the Levy Institute’s macro team have projected that $160 billion per year in new R&D investments could increase export volume and bring unemployment below 5 percent by 2016. There are far better reasons to push for more growth-friendly policies than a reduction of the debt-to-GDP ratio, but if the debt hawks are serious about this, if they believe the debt ratio itself has some sort of real and profound significance, they should look for allies among those who are already trying to change the conversation to growth and jobs. On the other hand, if the goal is really to scale back the social insurance system for its own sake, then by all means, carry on. Dimitri Papadimitriou, Greg Hannsgen, Michalis Nikiforos, and Gennaro Zezza have just published a new strategic analysis for the US economy, with a baseline projection and alternative policy simulations through the end of 2016. The report takes a closer look at the potential payoff of R&D investment in the context of a US export strategy. As Papadimitriou et al. point out, fiscal policy at the federal level is simply stuck on a self-defeating course, with nothing but further growth-killing contraction on the horizon. Their baseline projection shows that if we stay on the current fiscal path, in which the deficit continues to shrink rapidly, growth won’t be high enough to appreciably bring down the unemployment rate — as far out as 2016 unemployment would be just below 7 percent. The significant increases in federal spending that would be needed to accelerate the recovery and quickly bring down the unemployment rate don’t seem to be politically viable, to put it gently. So the authors turn to the external sector; more precisely, to an export-oriented strategy driven by innovation. They examine the effects of an increase in R&D spending of $160 billion per year (around 1 percent of GDP) through the end of 2016. This would be R&D expenditure focused on fields with applications in the tradable goods and service sector. In addition to the fiscal stimulus effects, part of the mechanism here is that innovation would increase average productivity in these export sectors, reduce unit costs and relative prices, and thereby boost export volume (“We assume that this spending is aimed exclusively at reducing domestic costs of production, although in reality the effects might also include bringing novel products to market overseas”). The results of the R&D simulation show that unemployment would drop below 5 percent by the end of the projection period (2016Q4), with economic growth nearing 5.5 percent. Their simulations also suggest that R&D investment would be slightly more potent than the same amount invested in infrastructure, though the authors don’t present this as an either/or policy choice. Papadimitriou et al. also introduce a note of caution in their new report. Many economic forecasts assume that the post-financial-crisis deleveraging process — the reduction of the private sector’s debt-to-GDP ratio — will end shortly. 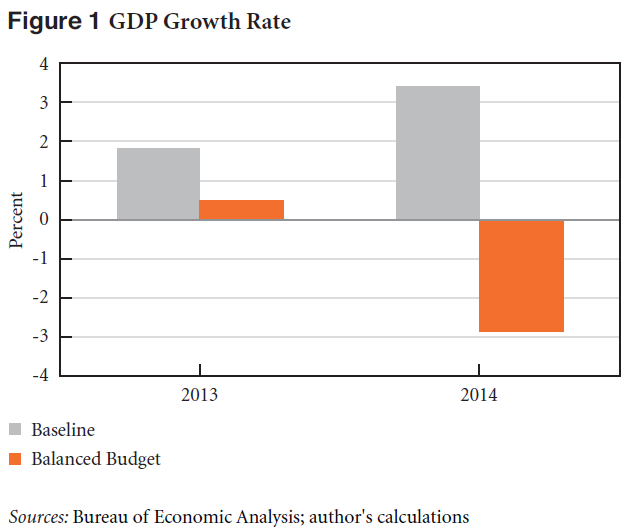 In other words, a lot of growth projections for the next few years assume renewed household and business borrowing. The authors run a simulation in which deleveraging continues for households in particular. Why should we consider this possibility? “Following the work of Wynne Godley, we think it reasonable to argue that historical norms are relevant as benchmarks for household indebtedness ratios.” In this instance, taking that approach would mean treating the private sector’s negative net saving from the 1990s through the 2000s as an exception. 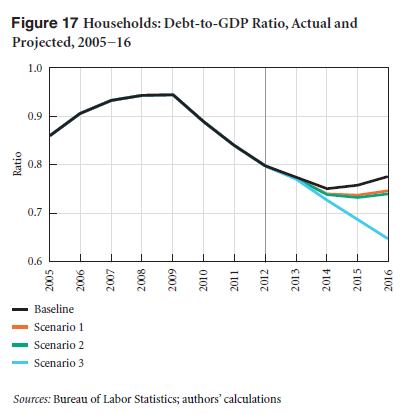 If households continue to reduce their debt levels, the positive effects of the R&D investment would be somewhat blunted: growth would just fail to reach 5 percent by the end of 2016 and the unemployment rate would be about 5.5 percent (compared to sub-5 percent unemployment for the R&D scenario in which the household deleveraging process ends). The upshot is that policymakers need to be prepared for the possibility that the deleveraging process is not finished. If households continue to reduce their debts, there will be even more drag on the economy — and an even more urgent need for ambitious thinking about policies to boost growth and employment. You can read the report here (pdf). “In 1948–49 the representative graduate student considered Schumpeter to be passé. Paying attention to him, joining him in his study was evidence of a lack of fundamental seriousness, of dilettantism. Given the command of mathematics that economists of that time possessed, Schumpeter’s model was not tractable. As a result his vision was ignored by the candidates striving to be mathematical economists and econometricians. Minsky the puppet had to travel from England to NY for filming. Question: how do you transport a huge puppet across the Big Pond? Well, you buy him a seat, of course! It would have been worth the price of airfare to be on that flight, buying Minsky a drink. In any event, I’m going to focus my comments around the conference’s kick-off presentation by the always entertaining Paul McCulley, formerly the brains behind PIMCO. I was sitting with Paul right before his talk, during which he apparently put the whole thing together. He asked for three fundamental principles to structure his presentation. In a matter of minutes he came up with three, fleshed them out, and then gave the kind of performance that only Paul can give. Herewith follows my recollection of his points along with my comments on each. Principle 1: Microeconomics and Macroeconomics are inherently different disciplines. Macro is demand-side; micro is supply-side. For any practical time horizon, demand always drives supply. Pavlina Tcherneva was interviewed yesterday on Los Angeles public radio about the ongoing debt ceiling face-off and government shutdown. She referenced Ben Bernanke’s “self-induced paralysis” phrase (which he used to describe Japan’s lost decade) as an accurate description of the current US situation and expressed concern that shutdown and debt ceiling standoffs may represent the new procedural status quo — effectively preventing the government’s fiscal power from operating on any normal basis. Tcherneva also discussed what we might expect from Janet Yellen’s Fed. Based on Yellen’s past testimony and academic work, Tcherneva argued we should see more of a focus on unemployment and employment issues, at least at the level of shaping the policy discourse — there is a separate question, Tcherneva cautioned, as to whether the Fed has the tools to get us to full employment. Listen to or download the interview here. Some commentators and members of Congress have insisted that failing to raise the debt ceiling would not necessarily require defaulting on the national debt. The theory is that Treasury could prioritize payments to bond holders while defaulting only on commitments to other payees (say, Social Security recipients). Most of the discussion of what might happen if Congress fails to raise the borrowing limit has focused on the financial market consequences of defaulting on the debt. But even if prioritization is possible (there is some debate about whether it’s logistically possible, or even legal), we would still be facing a serious macroeconomic crisis. What would that kind of radical austerity do to the economy? Michalis Nikiforos uses the Levy Institute’s macroeconomic model to estimate the effects of beginning rapid fiscal consolidation in the last quarter of this year and maintaining a balanced budget through the rest of the 2014 fiscal year (which is to say, through 2014Q3). (2) the private sector’s balance sheet is still fragile. If the US enters another steep recession, it could induce “a new round of rapid deleveraging, which would further push down the growth rate” (and, Nikiforos suggests, probably cause problems in the financial sector). Read the policy note here (pdf). As of today, it looks like John Boehner is trying to get House Republicans to agree to a short-term increase in the debt limit, of perhaps six weeks. If this passes and is accepted by the President (it’s not crystal clear right now whether there will be any demands attached to the House’s debt ceiling increase), we’ll be back on the edge of this macroeconomic crisis around Thanksgiving. Pavlina Tcherneva discusses the implications of the Great Financial Crisis of 2007 for employment outcomes and fiscal policy. She argues that the current view of Keynesian fiscal policies is based on a misreading of Keynes. Simply boosting demand — through what should be understood as trickle-down fiscal policy — is not sufficient to promote inclusive growth. Keynes originally called for a more targeted approach, including “on the spot employment,” as the means to achieve full employment and equitable and sustainable growth. L. Randall Wray argues that rethinking the State requires rethinking the relationship between the State and its currency. His analysis starts with the observation that money is based on State power (“currency sovereignty”): it is an “IOU” from the State — a liability — implying that fiscal constraints are in fact artificially created. In this sense, the State cannot run out of money, as it creates and enforces its own IOUs. Governments could — and should — afford to invest more in innovation and technology development to promote the capital development of the economy.